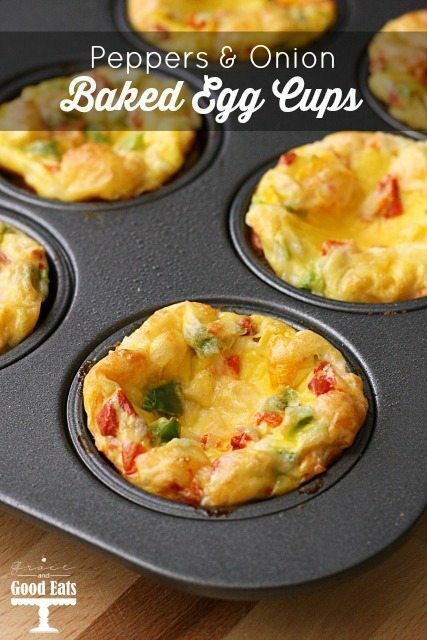 These easy oven baked Egg Muffins with onion, peppers, and cheese are the perfect grab and go breakfast! This is a sponsored post for SheSpeaks/Rubbermaid®. We love eggs in our house, and generally eat them for breakfast a few days each week. 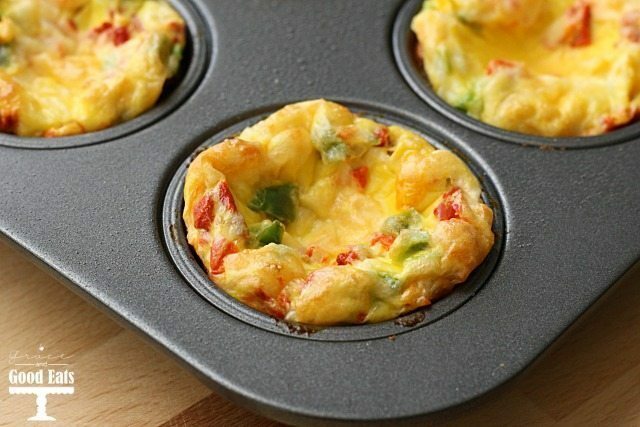 I make baked eggs regularly (like my Baked Eggs with Tomatoes and Feta or Italian Baked Eggs), but I decided to switch it up and use a muffin tin to make these baked egg cups. 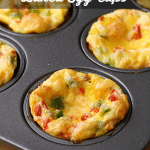 These baked egg muffins with peppers and onions are quick to prepare and perfect to grab and go. I will sometimes use a prepared bag of frozen peppers and onions to make this dish even easier. More often than not I just reach into my refrigerator and pull out whatever veggies I have on hand. We always have snacking peppers, and spinach for smoothies, so those are my two go-to favorites. Occasionally I will add in cooked meat, like cubed ham or breakfast sausage. 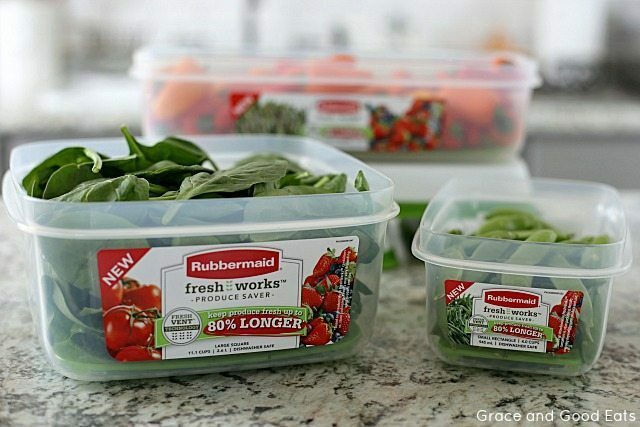 When Rubbermaid offered to send me a few of their new Rubbermaid FreshWorks Produce Saver products, I was intrigued. We have loved the Rubbermaid BRILLIANCE storage containers and use them all the time. The line extension of FreshWorks offers three new sizes for keeping produce fresh up to 80% longer* than traditional store packaging by using patented FreshVentTM technology. It uses a revolutionary built-in Rubbermaid FreshVent™ lid, which naturally regulates the flow of oxygen and CO2, in and out of the container to create the optimal environment so produce stays nearly as fresh as the day it was picked. The CrispTrayTM at the bottom elevates produce away from moisture and promotes proper airflow to help reduce spoilage. These Egg Muffins are even easier now that I can reach in and grab my produce from these clear, stackable containers! The variations are endless and they bake up so easily in the muffin tins. These breakfast cups are great with a side of fresh fruit. Pre-heat oven to 350 degrees and spray a muffin tin with cooking spray. Whisk together eggs and milk until light and fluffy. Stir in peppers, onions, salt and pepper. Divide egg mixture evenly between six muffin tins (about 1/3 cup each). Sprinkle cheese over each filled cup. Bake until eggs are set, about 25-30 minutes. 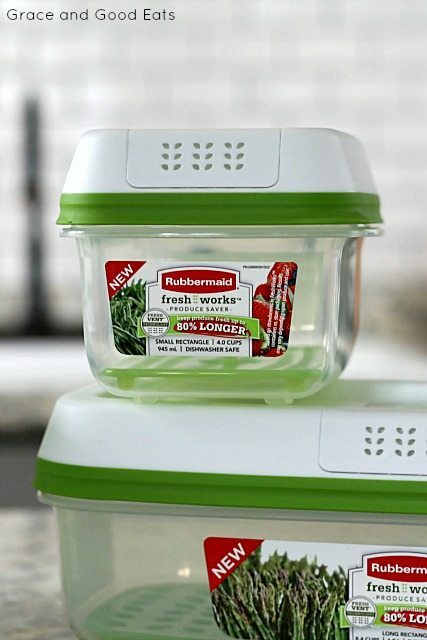 Want your own set of Rubbermaid FreshWorks containers? Enter below for your chance to win a prize pack from Rubbermaid. Terms and Conditions apply. View more information about the Rubbermaid FreshWorks product line here. OMG!!! I tried this and it is so simple and tasty. My very picky 6 year old cousin loves these too! She doesn’t even know that there are veggies in there. Great way to get protein. I make these once a week now. THANK YOU SO MUCH!!!!!!!!! Love how your veggies last longer.. No more waste. 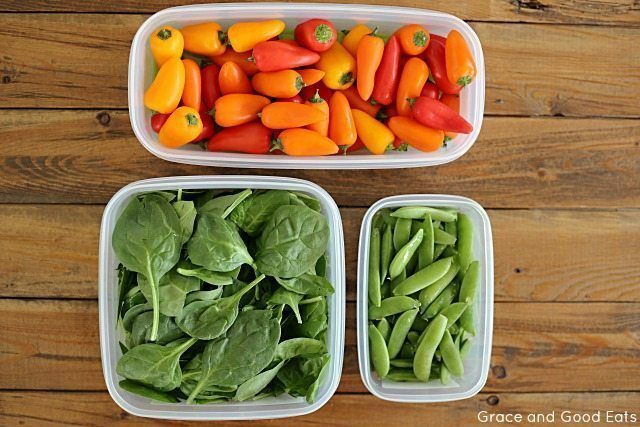 I love that these containers can keep your produce fresher for so much longer! I have also made a very similar recipe! It is wonderfully simple and great on the go! I love it keeps foods fresher longer. I also love the fresh vent lid as well. i would love to win these sooo bad. Thanks for the chance. My favorite feature is that it keeps veggies longer so you don’t waste money buying more or throw away spoiled food.